Fishing transporters are businesses that will take you somewhere to fish and drop you off and pick you up. Many of these businesses can provide full service guiding or charters if desired. 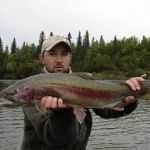 Alaska residence, hunting, fishing, sightseeing, river floats, bear viewing, guided, unguided. Great experiences.